2013 Canadian Baseball Hall of Fame inductee Tim Raines says his heart is still in Montreal. (Photo courtesy of Canadian Baseball Hall of Fame). Tim Raines understands the importance of family. The former Expo’s face lights up just talking about it. Like when he was asked, for instance, if he plans on taking his two-year-old twin girls, Ava and Amelie, to Montreal to show them where he spent 13 seasons of his 23-year playing career, Raines smiled and nodded in excitement. For the 53-year-old Raines, Montreal is where the heart is. 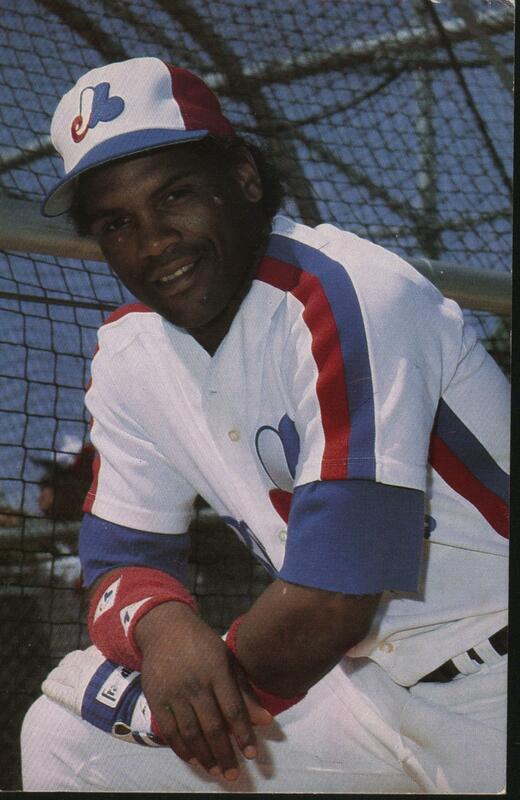 From 1979-1990, and again in 2001, Raines played 1,452 games wearing the Expos colours. During that time he recorded 1,622 hits, including 281 doubles and 96 home runs. With Montreal, the speedy Raines stole 635 bases of his career 808 total, a mark that’s good for fifth all time on MLB’s list. He led the league in stolen bases for four consecutive seasons from 1981-1984, including his career-best 90 steals in 1983. But that’s not what he wants to be remembered for. “A lot of people think I was that guy who wanted to be known for stealing a lot of bases and it wasn’t really like that,” the seven-time all-star said, addressing the crowd gathered in St. Marys upon his induction. “I stole bases to win games and that was the thing I did to help my ball club. I didn’t steal bases to get recognition. The outfielder hung up his cleats in 2002, taking a career batting average of .294 and a .385 on-base percentage with him into retirement. Eleven years later, Raines stood at a podium in front of a crowd of people in a small southern Ontario town, reminiscing on his career. His family couldn’t make the trip to St. Marys due to health problems, but he thanked them for all they had done for him. “I owe a lot of my career to my mother,” Raines said. “When I was a kid I used to see guys on television, when their face was on camera, they always said, ‘hi mom.’ Now I know what that really means. The Sanford, Fla., native went on to mention his father Ned Raines, a former semi-pro baseball player, and his two older brothers, Ned Jr., and Levi, who both played minor-league ball. But until Tim, no Raines had made it to the major-league level. So upon being drafted by the Expos in 1977, Raines made a pact with his father. “I promised my dad I was going to make it to the majors for him,” he said. Now he’s in the Hall of Fame — the Canadian one, at least. Though Raines has been on the ballot for the National Hall of Fame in Cooperstown, N.Y., since 2008, he’s fallen shy of the 75% tally needed for induction. This year, his sixth on the ballot, he received 52.2% of the vote. Raines says he is honoured to be recognized in the country in which he spent most of his career, both playing and now coaching. Hired by the Blue Jays earlier this year as a roving minor league instructor, Raines will participate in the club’s Honda Super Camp in Montreal next month. Roughly 80-to-100 kids are expected to participate, and Raines can’t wait to get back to his old stomping grounds. Though born in Florida and currently living in Arizona, Raines says he feels more Canadian now than ever. And it all comes back to family. Note from Kevin Glew: Melissa Couto is one of the most promising young talents in Canadian baseball writing. The quality of her work is consistently excellent. Please take the time to “Google” her name and you’ll come across some of the topnotch articles she has written for Canadian Press, the Toronto Sun and the Canadian Baseball Network. WHat a great induction weekend. Excellent story Kevin. i’m glad Mr. Raines didn’t mention the possibility of baseball returning to Montreal. Mr. Cromartie did that at the Gary Carter park renaming celebration last month and the mlb shot back with something like ….we have no plans in the next 10 years to expand, but montreal is a great baseball city. but bitter old me aside, this is a great article and a great story is Mr. Raines. hopefully he’ll move to montreal and take up coaching at the amateur level.